Featuring world renown singer, Benny Friedman. Accompanied by Mark Bloom & Marquis Music. Grand Sukkot Concert & Festival. Outside Fishman’s Kosher. Sunday September 26th. 4100 Minnetonka Blvd., St Louis Park, at 4PM – Tickets, Adults: $10 in Advance, $15 at event. Children $7 in advance, $8 at event. Family cap $75. Go to ChabadMinneapolis.com for more information. Featuring world renown singer, Benny Friedman. Accompanied by Mark Bloom & Marquis Music. 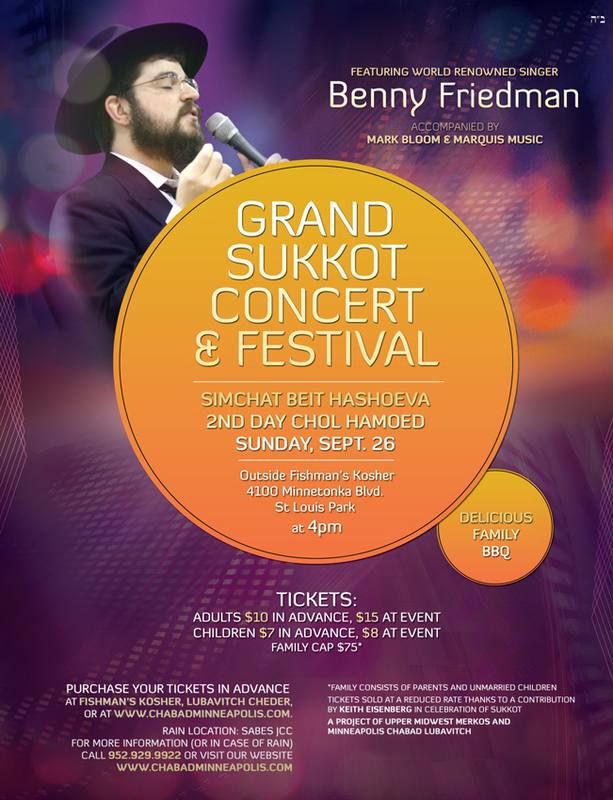 Grand Sukkot Concert & Festival. Outside Fishman’s Kosher. 4100 Minnetonka Blvd., St Louis Park, at 4PM – Tickets, Adults: $10 in Advance, $15 at event. Children $7 in advance, $8 at event. Family cap $75 – Go to ChabadMinneapolis.com for more information.